Your next phase on from landing blind is the S-Bend pass, or the aggressively popped front logo pass. It’s a blind judge tagged onto the end of an S-Bend in the same way that blind is tagged onto an S-Bend. The secret lies here, once more you will be combining two different moves that you could hopefully land, which in contrast to discovering something that is totally new from scratch. Remembering all this, give yourself enough chance to think about the goal you are trying to attain to get this job done. Let’s presume that you could successfully perform a smooth S-Bend, the chance is that you will finish in your fast rotation and consequently land thereafter with sufficient time to throw in a very swift last minute blind. You are going to need a bit more of elevation to pave way for a more successful pop and dare. Such option is suggestive of a smooth rotation finish and more time for a pass that is similar to a blind judge. You’ll be pulling big time and sway your front leg in the process so as to spin and acquire stability while closing the bar, thus, not trying to rotate into the pass from your spin but rather pull into the pass as you would normally. 1. With a light bar, sufficient height and good timing, you can achieve all the good pop you wish. In the demo picture A, we can see that the surfer is all set to pop and do a trick while preliminarily positioning the kite at 1 o’clock with some bursting speed. The idea is to come up with a good pop, so keeping the shoulders behind the hips while slightly flexing the knee gently and putting all the body weight over the back of the board would be the proper position for a pre-pop. Doing this, you could still have full control of the board as well as the kite for a maximum pop. Even though the aim is to rotate forward, the surfer is edging just as he would strongly proceed into a Raley. For a bit of height, this is the perfect timing to hurl the kite up in assisting a launch through the stratosphere. 2. In this picture, the surfer succeeded to do a good pop by pushing against his rear leg really hard, kicking at the rear end of the board. With an absolute speed, well positioned kite and proper body mechanics, this will lead you in an average ping forward and up. There is no chance for the surfer to move forward towards the kite – he doesn’t have a choice. Keep in mind that the extended rear leg is still straight from the launch and most importantly, the point when the board and the surfer’s front leg have flicked upwind while the upper body is turning the other way around from the rotation. Though randomly, this is by chance a laid out full Monty S-Bend. Allow the legs to be left behind by turning it upwind, only then you could break out from the rotation into a position which you recognize and rely upon from the Blind Judge. Give enough time and focus for just a split second after launching before releasing your upper body into the rotation. In addition, by keeping the elbows in on a rather chest level would facilitate your head to swivel around more quicker and with a lot of ease. 3. This is the outcome of the launch previously described in the other picture. The surfer could already start to mark his landing at the middle of his rotation, or at least see the water surface. This will give him such an instinct that will allow him to get set and be ready for the pass. From this particular position, the goal is to get your head and hands approximately around the rest of the rotation. Make sure that you have given enough height allowance before you go for the pass. 4. You should always remember this particular position, as it is not too far-off the position and you’d be in pre-Blind Judge post Raley. The legs and the board are high, upwind, flicked back and the bar is turned palms upwind, it’s just the shoulders position that is a bit off, but they’re on their way around. With the front leg extended and up, the surfer now pulls hard, taking his hands down towards past his right leg while pulling his right knee up towards the hand. This would get the rotation for an air pass under way. Concentrate and keep yourself focused because the next critical part to worry about is to submit to the pass. 5. 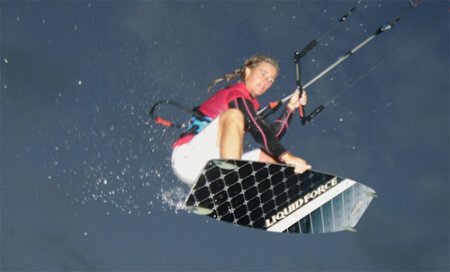 As the kite surfer’s front leg swings down and under the bar, he releases his back hand and turns his head, just as he would be in a Blind Judge as he twists his front hand down and around. This lets his head and shoulders turn further into an airborne blind. Although in this demo picture the legs are frozen slightly behind him, they are actually moving forward at a high velocity as it swings downwind towards the bar. 6. The result of which is that the legs rock the board under the bar. This puts the surfer in a rather less intimidating position with his weight under the board and his feet under him. It will then allow him to perform a rotation around his front arm while aiming for the pass with his free back arm. Just like the Blind Judge, you can do all possible good work leading up to this point. but if you do not look for the pass with your free hand, good things are not most likely to happen. The moment you have passed the bar, try to hold your arm closer to pull your shoulders up for a neat landing just like a pro. Before trying the air pass come out from a variation of soaring S-Bends, do not hesitate to find out which best works for you. Landing them successfully should be easy even at the end of your rotation up high, for this shows that you are going to do the rotation effectively and not over-rotate into the pass. Once you have stabilized and assembled both your confidence and your alertness of your position in the air, go for the pass. Keep in mind that you may need to grasp onto the bar a tad longer than you think before holding the bar with your free hand. If you set off immediately, you won’t be able to spin timely for a pass. Review sequence 1 and 2 to attain a plan of the timing. We’re not going to tackle everything but try and observe the part where the pass is “activated” up high. You will have limited time if you just wait further going down, time is of the essence, so better get that S-Bend done early and so timely. The classic – the bar pulling up and away as kite goes high. If you stick into this move conservatively, you will not obtain the pop, so in order to make up for it, you’re going to hurl the kite right up and achieve the pass as high as possible. Go and locate some deep water and give the launch a nice preparation. Another common problem is passing the bar and the board when still too distant from you and even upwind when you get the pass (but never from landing because it is really on your side edge). You are not pulling your legs underneath and swaying them under the bar. So remember to toughen both your legs and arms as well. When your knees come up untimely or early, you cannot sway your legs through, so give them a nice extension behind during takeoff time. There are several ways to make your tricks look a bit more stylish. This trick is particularly stretched when you ride or turn you yourself. Another very effective way is to grab on your board. Grabbing the board is certainly borrowed from the surfing and skating. Since neither surfing nor skating bindings are available to make sure that you stay connected to the board, the grab has been found to be the only way to keep the board to their feet when jumping. Over time, many have developed several variants to grab. In Kite surfing we can basically distinguish between jumps, jumps with umbrella support and jumps without umbrella support. The grab without Kite support are much more difficult because you do not have much time to grab on to your board. Although it’s easier with kite supporting grabs it don’t mean that they are less stylish. We show you the easiest start for grabs so you can add a bit of your own kitestyle to them. To grab your board does not require much skill. You should be sure to control your kite with one hand as you grip the other hand to your board. In addition, you should be reasonably flexible to bend your back. The more flexible your legs and back are, the easier it will be and also look better on the water. In the beginning it will be relatively difficult to find a comfortable position, but gradually it gets easier as you learn to grab the board. As you get more and more comfortable, the more you will be able to stretch one or both legs. So a lot of practice helps a lot. Technically, there are equipment as well as preferences. If you start with high jumps with kite support, we recommend without doubt a kite with a long hang time, so you have plenty of time to grab your board. Also recommended is a medium-large board. The larger the board, the more clumsy and uncontrollable. Many riders prefer a hip harness also which gives you more leeway to twist your body. Seat harnesses are also perfectly fine for practicing this trick. The Indy Glide is one of the standard tricks. It belongs to the group of loaded jumps. You can make the Indy Glide either hooked or unhooked. In both ways, however, with right conditions you should try to make it without kite support, otherwise it belongs to the group of umbrella supported tricks. It is relatively difficult to make the Indy Glide look stylish, because you do not have much time to perform the trick. Ride with medium speed and to keep your kite at 10:30 o’clock. Edge hard to build up tension in the lines. Release the edge of the water and pop out of the water. The really important trick to Indy Glide is to go into a kind of forward rotation. So you have to look back over your head with your shoulder and make a half-forward rotation. Release your back hand and grab the bar at the front center of your board. Attempt to straighten your back leg as strong as possible and bring your front knee to your chest. Release the grab and look back in the same direction. Bend your knees to cushion the landing.